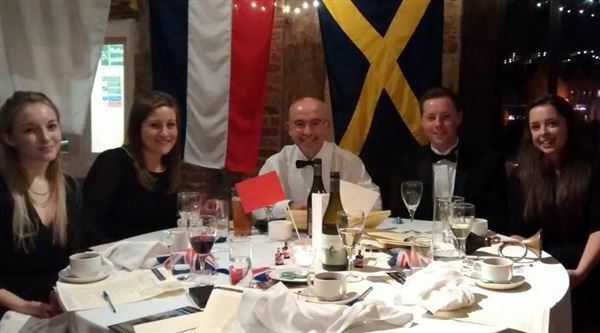 21st October 2014 saw 51 business leaders, partners and young people across Norfolk gather together for the nelsonspirit Trafalgar Dinner in Dragon Hall, to celebrate six years of nelsonspirit being active in Norfolk and to launch the future leaders fund. Addison's Uncle, a leading Norfolk folk band, opened the evening, featuring band member James Maas, nelsonspirit's newest intern for January 2015. Guests received arrival drinks of Norfolk Shackleton ale, a three course meal provided by expresso catering on St Georges St, and were treated to 'Rule Britannia' grand finale from the Taverham brass band. The tribute speech to Nelson was given by Nigel Cushion.